Last week we began our blog series on caring for people with dementia. We discussed what one may expect to encounter and briefly touched on three of the main forms of dementia. Each of these forms of dementia have many similarities with the others but are also vastly different. It is important to note that despite the form, dementia progresses differently for each person. This week we will explore Vascular dementia in depth. According to the Alzheimer’s Society, Vascular dementia is the second most common form of dementia accounting for 20-30% of dementia sufferers. This particular form of the illness is caused by “reduced blood supply to the brain due to diseased blood cells”. The onset of Vascular dementia often occurs suddenly as a result of a stroke that causes blockages in major blood vessels. Considering there are several forms(6) of vascular dementia, it is not uncommon for vascular brain changes to coexist with other types of dementia. While these different subtypes of dementia have some symptoms in common, they differ in speed of progression as well as which part of the brain is affected. Since each type of vascular dementia has several symptoms that differ from the others, we will focus on the symptoms they have in common. Having an understanding of what to look for will allow you to better care for your patient or loved one suffering from vascular dementia. 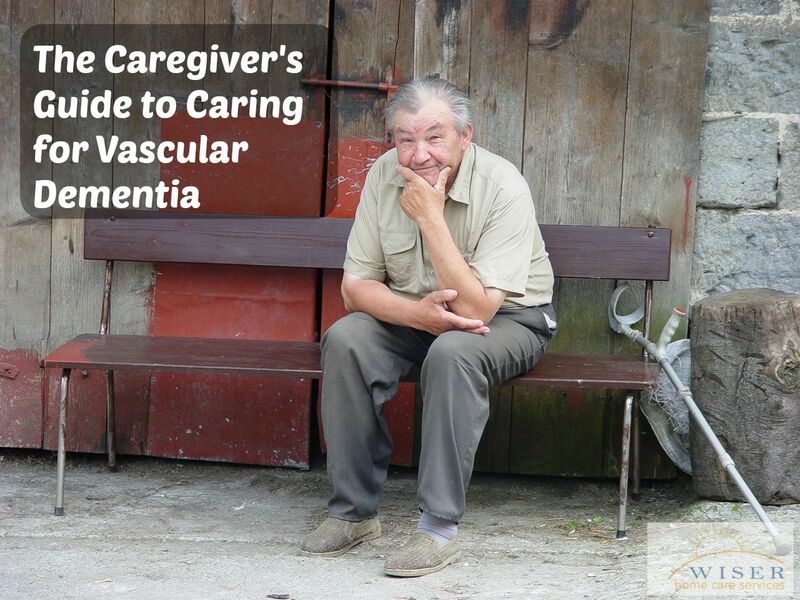 Another important aspect of caregiving is knowing ways to reduce one’s likelihood of suffering from vascular dementia. As we mentioned earlier, the older one gets, the more likely they are to experience dementia. However, keeping one’s blood pressure at a healthy level by maintaining a healthy diet and exercise plan is a great way to reduce one’s risk. In addition to stopping smoking, it is also advisable to quit drinking if you are at risk of vascular dementia. Like many other illnesses, taking preventative measures, being aware of the symptoms and catching it early are the best ways to prevent and reduce the effects of vascular dementia. At Wiser Home Care Services we understand the challenges of caring for a loved one with dementia. Our caregivers receive special training to care for seniors with these needs. Wiser Home Care Services works with all medical professionals involved to develop a consistent plan of care tailored to the needs of each client. Additionally, Wiser Home Care Services can provide support to a family caregiver when it comes to disease management. This allows families to spend more quality time together. If you care for an elderly loved one and would like help please contact us.